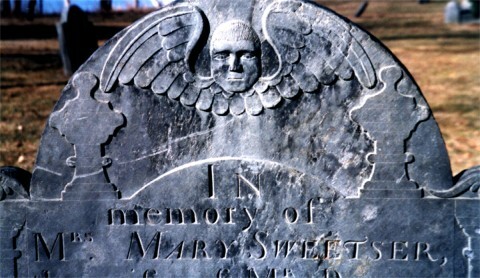 "Skulls, Cherubs, and Urns: The Art and Symbolism of Gravestones"
Through the use of slides and illustrations she showed the popular motifs and epitaphs from the 17th through 19th century and discussed their significance. 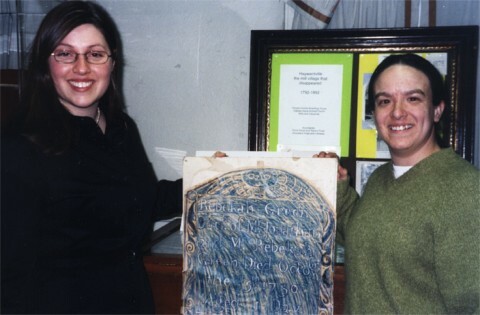 She detailed the sylistic differences of gravestone art and the local stone carvers who produced it. Below are two photos that represent the slides she used during her presentation. With Alicia is Amy Fantasia of Reading (right). Both are of Preservation Consulting based in Boston, MA. 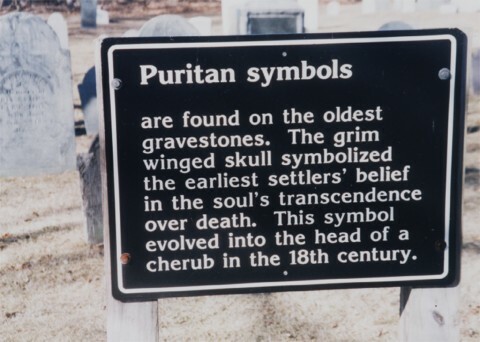 Source: Stoneham Historical Society, March, 2002.